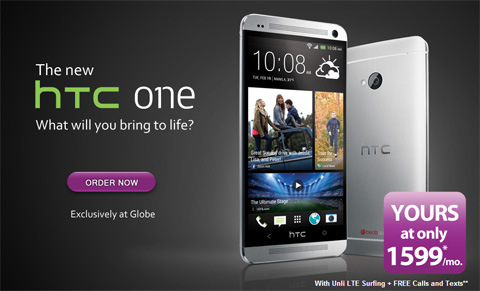 Globe grabs exclusivity for the HTC One as previously rumored on the handset's Philippine launch. Now, you can get the "all metal" HTC One in both Plan 999 and Plan 1799 with different cashouts. Plan 999 has a one time cashout of Php 14,400 or you can opt to pay a Php 600 monthly cashout (Php 900 + 600) to make it a Php 1599. Both options are bundled with 101 SMS and 5-minute worth of calls to all networks. The other offering, Plan 1799, comes with a one time cashout of Php 4,800 and bundled with 1101 SMS and 55 minutes of calls to all networks. Both plans are under a 24-month contract and are capable of using Globe's unlimited LTE network. For the uninitiated, HTC One is the 2013 flagship of the Taiwanese giant which steals an ample amount of lightning from its major competitor, the Samsung Galaxy S 4. It sports a 4.7-inch display with 469 ppi pixel density, 1.7 GHz quad-core CPU, 2GB RAM, all metal design and dual frontal speakers enhanced with Beats Audio.